11/7/09: Updated below the legend with an opinion of Ralph Peters. Thank you, Ralph. A timely message! Our hearts are heavy... Our prayers and thoughts are with our sons and daughters and their sons and daughters at Ft. Hood. Be sure to read Greyhawk's initial reporting on those who were killed yesterday... and be sure to check back at Mudville Gazette often for updates. On Thursday afternoon, a radicalized Muslim US Army officer shouting "Allahu Akbar!" committed the worst act of terror on American soil since 9/11. And no one wants to call it an act of terror or associate it with Islam. What cowards we are. Political correctness killed those patriotic Americans at Ft. Hood as surely as the Islamist gunman did. And the media treat it like a case of non-denominational shoplifting. When the terrorist posts anti-American hate-speech on the Web; apparently praises suicide bombers and uses his own name; loudly criticizes US policies; argues (as a psychiatrist, no less) with his military patients over the worth of their sacrifices; refuses, in the name of Islam, to be photographed with female colleagues; lists his nationality as "Palestinian" in a Muslim spouse-matching program, and parades around central Texas in a fundamentalist playsuit — well, it only seems fair to call this terrorist an "Islamist terrorist." But the president won’t. Despite his promise to get to all the facts. Because there’s no such thing as "Islamist terrorism" in ObamaWorld. And the Army won’t. Because its senior leaders are so sick with political correctness that pandering to America-haters is safer than calling terrorism "terrorism." And the media won’t. Because they have more interest in the shooter than in our troops — despite their crocodile tears. Maj. Nadal Malik Hasan planned this terrorist attack and executed it in cold blood. The resulting massacre was the first tragedy. The second was that he wasn’t killed on the spot. Hasan survived. Now the rest of us will have to foot his massive medical bills. Activist lawyers will get involved, claiming "harassment" drove him temporarily insane. There’ll be no end of trial delays. At best, taxpayer dollars will fund his prison lifestyle for decades to come, since our politically correct Army leadership wouldn’t dare pursue or carry out the death penalty. Maj. Hasan will be a hero to Islamist terrorists abroad and their sympathizers here. While US Muslim organizations decry his acts publicly, Hasan will be praised privately. And he’ll have the last laugh. But Hasan isn’t the sole guilty party. 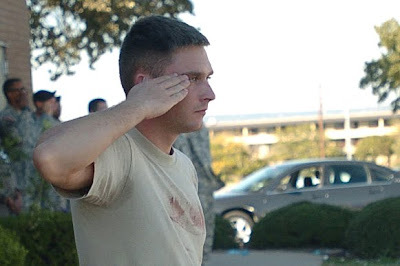 The US Army’s unforgivable political correctness is also to blame for the casualties at Ft. Hood. Given the myriad warning signs, it’s appalling that no action was taken against a man apparently known to praise suicide bombers and openly damn US policy. But no officer in his chain of command, either at Walter Reed Army Medical Center or at Ft. Hood, had the guts to take meaningful action against a dysfunctional soldier and an incompetent doctor. Had Hasan been a Lutheran or a Methodist, he would’ve been gone with the simoon. But officers fear charges of discrimination when faced with misconduct among protected minorities. Now 12 soldiers and a security guard lie dead. 31 soldiers were wounded, 28 of them seriously. If heads don’t roll in this maggot’s chain of command, the Army will have shamed itself beyond moral redemption. There’s another important issue, too. How could the Army allow an obviously incompetent and dysfunctional psychiatrist to treat our troubled soldiers returning from war? An Islamist whacko is counseled for arguing with veterans who’ve been assigned to his care? And he’s not removed from duty? What planet does the Army live on? For the first time since I joined the Army in 1976, I’m ashamed of its dereliction of duty. The chain of command protected a budding terrorist who was waving one red flag after another. Because it was safer for careers than doing something about him. Get ready for the apologias. We’ve already heard from the terrorist’s family that "he’s a good American." In their world, maybe he is. A disgruntled Muslim soldier murdered his officers way back in 2003, in Kuwait, on the eve of Operation Iraqi Freedom. Recently? An American mullah shoots it out with the feds in Detroit. A Muslim fanatic attacks an Arkansas recruiting station. A Muslim media owner, after playing the peace card, beheads his wife. A Muslim father runs over his daughter because she’s becoming too Westernized. Muslim terrorist wannabes are busted again and again. And we’re assured that "Islam’s a religion of peace." I guarantee you that the Obama administration’s non-response to the Ft. Hood attack will mock the memory of our dead. Ralph Peters’ latest novel is "The War After Armageddon." FORT HOOD, Texas — Former President George W. Bush and his wife, Laura, visited wounded soldiers and their families near the site of the worst mass shooting on an Army post in the United States. AND WHERE IS OUR ESTEEMED PRESIDENT??? Thanks for sharing. I have never been to this web page but it has a ton of infomation.